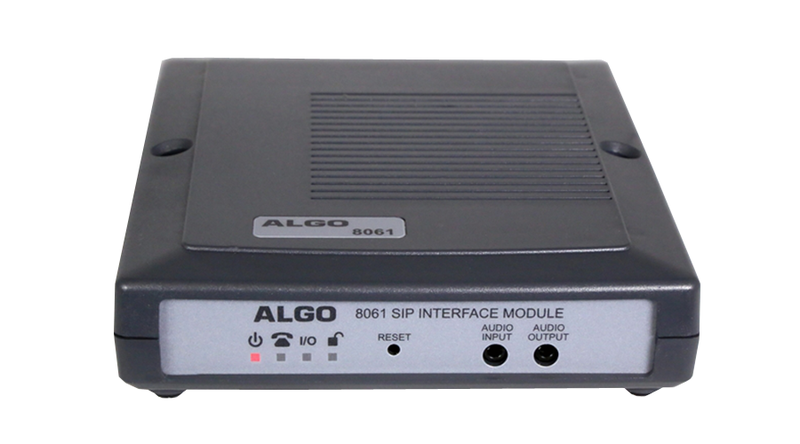 The 8061 provides a IP Relay Controller for the Algo 1202 CallBox, door opening control for the 8036 SIP Multimedia Intercom, and general purpose relay and audio input/outputs. The 8061 is essentially a bridge between the IP network and peripheral hardware. Up to four 1202 SIP CallBoxes are supported by each 8061 which may be configured to multicast a page and/or call a telephone unique for each CallBox. Due to network connectivity, many other actions are possible including escalation for non-response and email notification. Metrics stored in 8061 memory such as activity logs and response times are available using the web interface and may be automatically sent by email on a periodic basis. The four relay outputs are individually programmable and may be used to activate visual or audible alerters for ring, in-use, message waiting, queue status, or any other event that can be communicated over the network. The four relay inputs are individually programmable to monitor dry contact closure events such as a call button, door open, smoke alarm, power outage, PIR detector, temperature sensor, flood detector etc to initiate phone calls with voice messages, emails, multi-cast audio alarms, and more. The wideband analog audio input may be streamed to other devices, multicast, or delivered to another 8061 over the network and made available on the analog audio output along with a dry contact closure detected and repeated. As a door opening controller, the 8061 can be located in a secure environment to prevent tampering and also includes a door sensor input to deactivate the door strike once the door is opened, generate alarms if a door is jammed open, or stop ringing if the door is opened before an intercom call is answered. The door control feature is activated by a command from the 8036 SIP Multimedia Intercom based on time of day, from the answering telephone keypad, or entry of the door release code by a visitor.